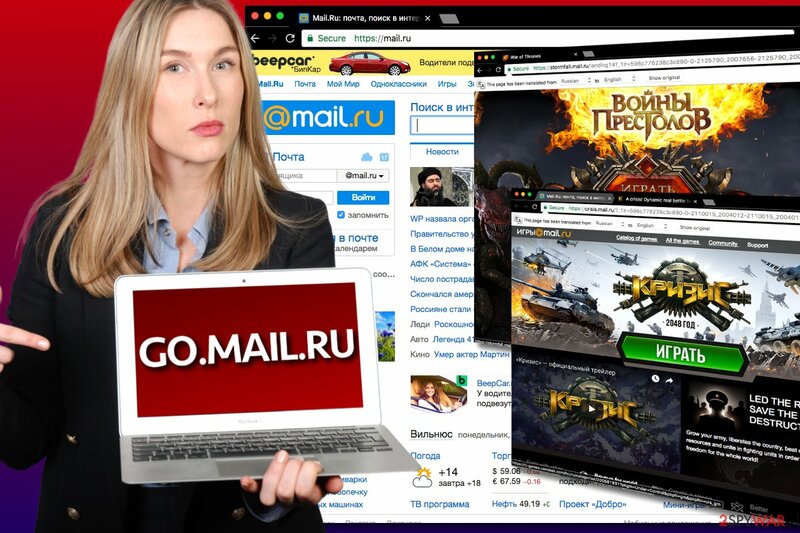 Go.mail.ru is the PUP that uses misleading techniques to prevent removal. Use Reimage to locate malicious components and get rid of them faster than with uninstall instructions. A full system scan blocks virus reappearance and prevents traffic to malicious domains. Go.mail.ru virus is a program that displays intrusive ads every time you try to use your device. Go.mail.ru is a website which has been actively promoted with the help of potentially unwanted programs (PUP). It operates as a browser hijacker that mostly targets Russian-speaking users. Once inside the computer, the virus redirects them to desired locations by presenting forged search results. As a result, the PUP affects the performance of your browser or device in general. This cyber threat mostly aims at Google Chrome and Mozilla Firefox browsers. No matter how harmless Mail.ru virus seems, we recommend not using it as a safe source of news. Beware that this website displays only fake articles and intrusive advertisements while actively collecting browsing-related information. prevent users from Go.mail.ru removal. As you can see, the program that promotes go.mail.ru вирус is designed to complicate browsing sessions on the affected computer. One of the most annoying features is that users cannot set their preferred startup page and built-in search engine due to the hijacker’s functionality. Mail.ru virus protects itself by installing additional browser add-ons and extensions which will automatically set the malicious domain as a homepage once the user tries to delete or reset them. It is also known that the hijacker creates C:\Program Files (x86)\Mail.Ru\ and C:\Users\Home\AppData\Local\Mail.Ru folders in the system. However, Mail.ru removal is still possible and recommended due to suspicious redirect tendencies and possible privacy-related issues. 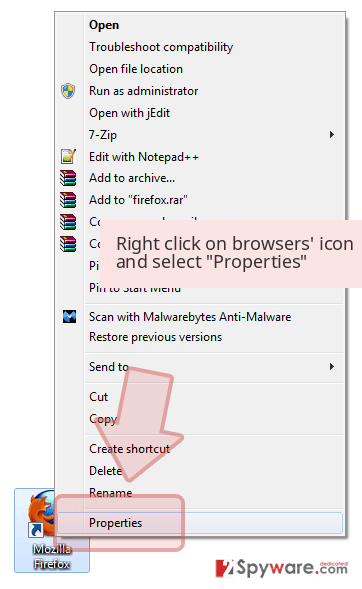 For quick hijacker’s elimination, you should use Reimage and reset affected browser’s settings. Go.mail.ru is an annoying search site that is full of links to external sites. It is believed that it is being promoted with a help of potentially unwanted programs such as browser hijackers. Mail.ru virus forces people to use a questionable search engine which might contain links to highly suspicious sites. Some of the links on the results page might be altered, meaning that you might be tricked into clicking sponsored links which barely has something in common with the information you searched for. However, the main issues related to Go.mail.ru redirect tendencies are that hijacker might trick you into visiting phishing, tech support scam or infected websites. Therefore, your chances to suffer from the cybercrime increases after browser hijack. 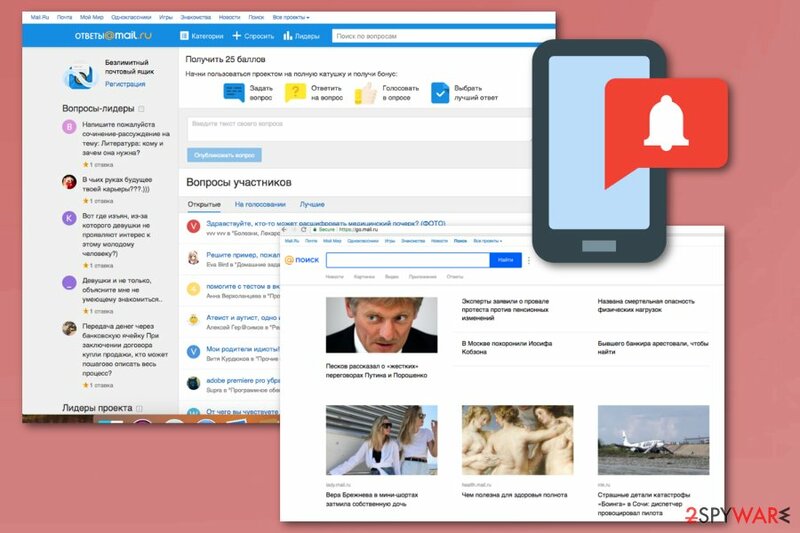 Nevertheless, the Mail ru virus is not dangerous itself; it creates the right conditions to browse through insecure or potentially harmful sites. Keep in mind that the same problem exists with ads that might be displayed on any website too. 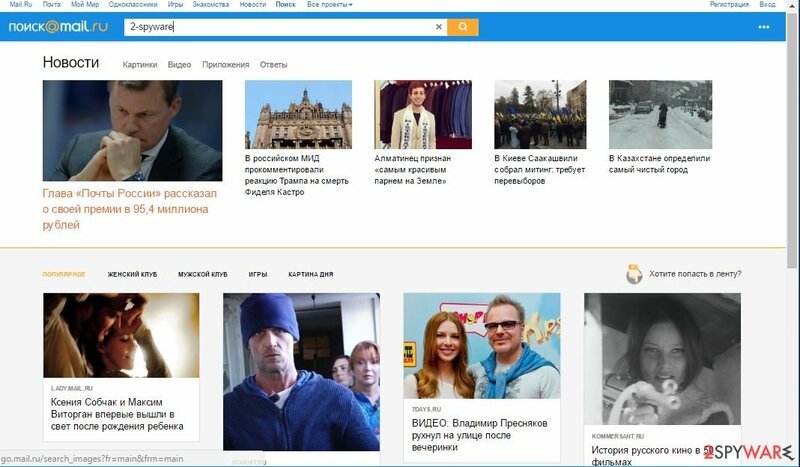 Go.mail.ru is a site that looks like a legitimate news site for Russian-speakers. However, this is a potentially unwanted program. The problem with ads displayed by Mail.ru virus is that they might look legitimate and useful. However, the reason why is very simple. The PUP can collect information about your browsing activities, including search queries, browsing history, IP address and other personally non-identifiable information with the help of tracking cookies and web beacons. Aggregated details help to display targeted ads that you are more willing to click. Keep in mind that authors of the hijacker generate revenue from ad clicks and boosting traffic to sponsored sites. To make as much money as possible, the hijacker might display an enormous amount of commercial content which diminishes browsing experience. Hence, it’s necessary to remove mail.ru malware to get back to safe browsing. As you already know, Go.mail.ru is a Russian website, but it does not imply that you can only infect your computer if you live in this specific region, visit Russian websites or download software originating from this country. In fact, this potentially unwanted program mainly travels via software bundles, so there is no actual difference to what programs is it attached. The important thing is to know how to disclose such programs and stop them from being installed on your computer. Fortunately, it is quite simple. When installing new programs on your computer, choose “Advanced” installation settings and follow the installation stages carefully. If some shady software package components emerge, eliminate them immediately and proceed the installation safely. Go.mail.ru virus is a browser hijacker that collects various information about your internet habits. After a browser hijack, many users struggle with Mail.ru removal. 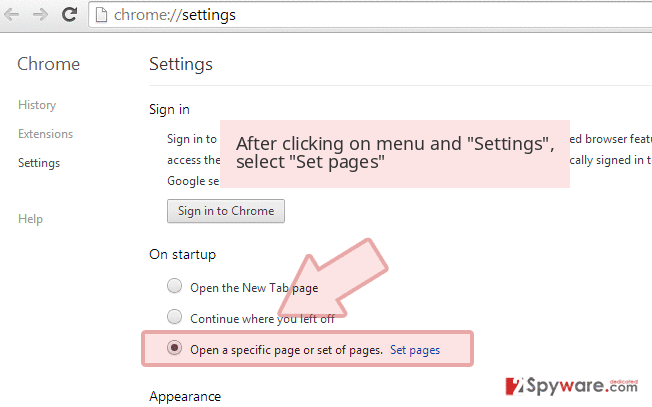 The hijacker might be hard to remove because it might alter browser’s settings and Windows Registry. Hence, all the attempts to change this Russian website with a preferred startup page are designed to fail. However, if you are looking for a way how to remove go.mail.ru after countless attempts to get rid of this site, we recommend installing anti-malware software and scanning the system. 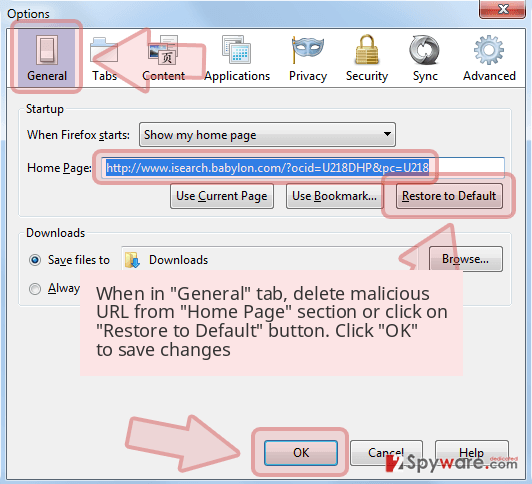 You can find our suggested removal tools below, or you can choose any other reliable anti-malware/anti-spyware. Additionally, you can follow our prepared instructions at the end of the article and opt for manual Go.mail.ru removal. This method requires uninstalling suspicious programs, add-ons, and other questionable entries. Browser reset is also needed to delete tracking cookies. To delete Go.mail.ru virus from Windows, you need to uninstall programs that are related to it. Keeping them on your computer system is a major problem and not all of the antivirus systems are capable of identifying them since some of them belong to spyware and not malware category. Thus, we have prepared these instructions to help you get rid of the virus manually. We hope that you will manage to find the virus (which may be hiding under different titles) and banish it from the system successfully. What is even more important is that you check shortcuts of Chrome, Firefox, and other popular browsers the way that we described below. 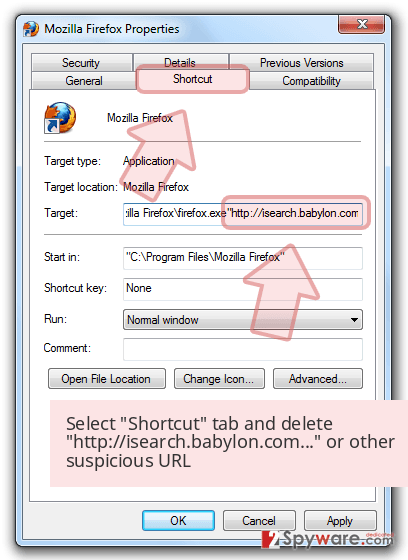 Sometimes browser hijackers compromise these shortcuts so that the user would experience redirects to the suspicious search site each time he opens a web browser. TIP: This browser hijacker often tries to modify Registry keys, browser shortcuts, and other system settings just to keep itself in the system. System settings, especially Windows Registry should be altered by experienced IT professionals only, so if you do not want to spend a day trying to delete the virus manually, we highly recommend using automatic spyware/malware removal tool. Make sure you update it to the latest version and run a couple of system scans to entirely eliminate the threat. Here, look for Go.mail.ru or any other recently installed suspicious programs. Wait until you see Applications folder and look for Go.mail.ru or any other suspicious programs on it. Now right click on every of such entries and select Move to Trash. When in the new window, check Delete personal settings and select Reset again to complete Go.mail.ru removal. Once these steps are finished, Go.mail.ru should be removed from your Microsoft Edge browser. To uninstall go.mail.ru redirect virus from Firefox, you need to delete Firefox add-ons related to it. 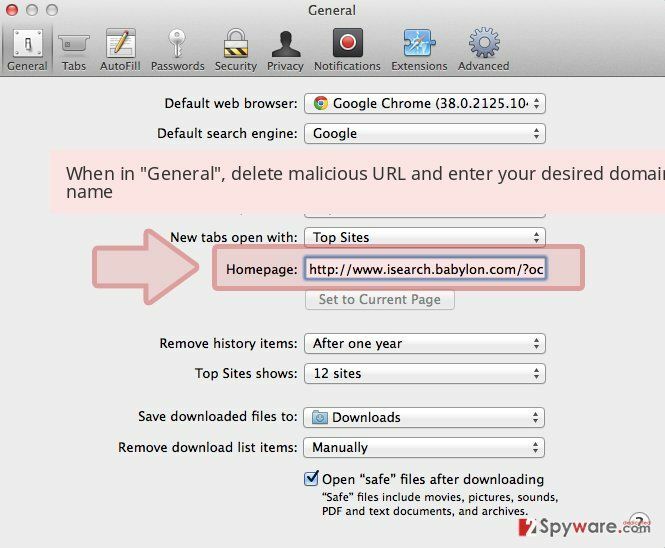 We suggest looking for all kinds of suspicious add-ons, especially ones that promise you an “improved search experience.” Once you delete the suspicious Firefox add-ons, refresh your browser. Here, select Go.mail.ru and other questionable plugins. Click Remove to delete these entries. Now you will see Reset Firefox to its default state message with Reset Firefox button. Click this button for several times and complete Go.mail.ru removal. 1. Delete associated browser extensions. 2. Delete suspicious URLs from “On Startup” setting and also from “Default Search” setting. Here, select Go.mail.ru and other malicious plugins and select trash icon to delete these entries. Click Reset to confirm this action and complete Go.mail.ru removal. Here, select Extensions and look for Go.mail.ru or other suspicious entries. Click on the Uninstall button to get rid each of them. Here, look at the Homepage field. If it was altered by Go.mail.ru, remove unwanted link and enter the one that you want to use for your searches. Remember to include the "http://" before typing in the address of the page. Now you will see a detailed dialog window filled with reset options. All of those options are usually checked, but you can specify which of them you want to reset. Click the Reset button to complete Go.mail.ru removal process. ^ Bedynet. BedyNet RU. Computer Security Tips for Russian-speaking PC users. 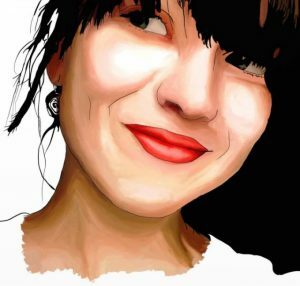 ^ Joanna Geary. Tracking the trackers: What are cookies? An introduction to web tracking. The Guardian - Technology. Latest Technology News, Comments and Analysis. ^ Vangie Beal. Web beacon. Webopedia. Online Tech Dictionary for IT Professionals. This entry was posted on 2018-09-04 at 04:04 and is filed under Stealing programs, Viruses. You can quickly scan the QR code with your mobile device and have Go.mail.ru virus manual removal instructions right in your pocket. How did you remove Go.mail.ru virus?